By now you might be aware how much I love colored contact lenses and this time I present an international online shopping site exclusively for contact lenses. This site is called Lensvillage.com. and this is what i got, well again i chose them in green which is my favorite color. Let get into some more information about the site and they say. About the company- Lensvillage.com is one of the largest circle lens store, they provide the widest choice of color lenses that come with different kind of attractive design and colors. Their aim is to provide excellent customer and delivery service that is committed to customer satisfaction. They provide large choices selection and sell famous brands mainly from Korea. LensVillage.com sells 100% authentic lenses only or money back guarantee and their products are all certified by Korea Food and Drug Administration. They ship worldwide and that too at really low prices. Look at that cuteeee contact lens case. I got them in the color green from the brand colorvue. I absolutely loved this color. This color will look great on fair skin tones however, it can be a bit harsh for the dusky and medium or wheatish complexions. Will show you how the lenses looks on me tomorrow in the next post, till then take care!!! I am waiting to see how they look on your eyes..
waiting eagerlyyyy to c u in the green lenses.. The lens case is so cute! 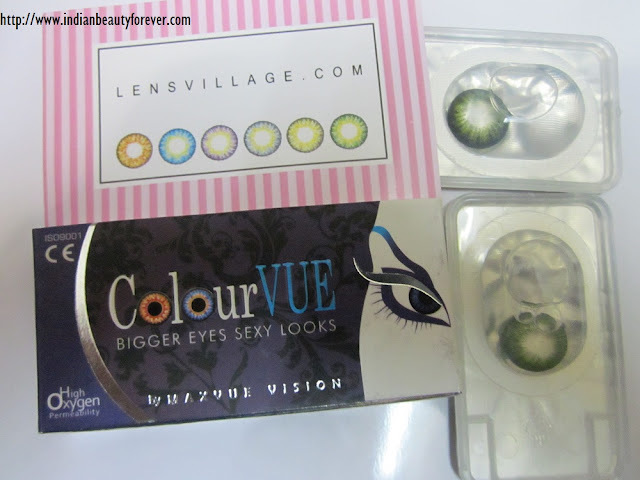 BTW, how long did it take before the colourvue lens were delivered to you? how much r the lens for? Cute case! I'm looking forward to seeing you wearing them!